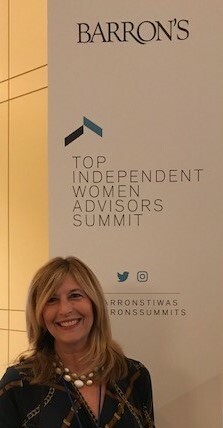 Washington, D.C. (June 14, 2017)—Mari Adam, President of Adam Financial Associates, Inc. attended the second annual Barron’s Top Independent Women Advisors Summit, hosted by Barron’s magazine to exchange ideas and best practices, with an eye towards improving their business and serving the investing public in the best possible manner. The invitation-only conference was held June 12-14 at The Mandarin Oriental in Washington, D.C. This exclusive conference was designed to convene a group of highly successful independent advisors, to discuss how trends and shifts in the wealth advisory business create both unique challenges and opportunities for leading female practitioners. Barron’s-ranked women advisors, independent channel industry leaders and renowned advisor coaches conducted sessions that explored subjects ranging from human capital development, core business strategy and management, capital structures and innovation. “America needs wise and proven financial leadership. This conference brings together the best advisors in the country to share information and ideas toward one goal – to better serve their clients, their families and their communities,” said Sterling Shea, Associate Publisher and Head of Wealth Management Programs at Barron’s. Mari Adam was one of approximately 150 financial advisors who were either selected by Barron’s or their affiliated firm to attend and participate in the conference. Participating firms included: Advisor Group, Ameriprise Financial Services Inc., Charles Schwab & Company, Fidelity Investments, Interactive Brokers Group LLC, LPL Financial Services, Raymond James Financial, TDAmeritrade and Wells Fargo Advisors Financial Network.